In honor of Super Bowl Sunday, what is your favorite snacking food to enjoy in front of the tv? Frankly, I live a salty snack like popcorn or chip's. How 'bout you? This is linked to Aloha Friday. Click here and stop by for a visit. I'll ask a question and you leave me your response in the comment section. So what is your most lofty goal for 2010? Mine is to get some regular exercise. I have let my exercise lapse. Frankly I cannot stand to exercise but I recognize it is necessary in order not to burn out, fizzle out, or rust out. Because I am involved with ministry, teaching moms, writing studies, traveling, and encouraging women to walk with Christ, I realize that this issue cannot be ignored or neglected. Bummer. In Hawaii, Aloha Friday is the day that they take it easy and look forward to the weekend. So I thought that on Fridays I would take it easy on posting, too. Therefore, I’ll ask a simple question for you to answer in my comment section. Don't forget to leave comment. Nothing that requires a lengthy response. Aloha! If you have your choice of background music, what is it? I personally enjoy silence occasionally, but I to like to have some music playing in the background. I like alot of different kinds of music but my favorite is contemporary Christian music. And currently my favorite is Kari Jobe who does "Revelation Song" that is so worshipful I feel like I am being swept into heaven. And then there are The Gettys whose song "In Christ Alone" stirs me to tears every time I hear it. Now what is your favorite choice of music? From my boggy heart to yours-I wish you a gloriously lovely Christmas season. Linked to Aloha Friday at Island Life. So are you having turkey or ham for your main course on Thanksgiving? Or do you fix something else. What is it? What is the main course of your Thanksgiving meal? We are having a ham and several rotisserie chickens with dressing rather than cooking a turkey. It will simplify the meal a bit and my family does not really care for turkey. Happy Thanksgiving. have a wonderful holiday. Look for my sausage and pecan stuffing recipe on Tuesday. It is wonderful. For more Aloha Friday click here and don't forget to leave your answer in the comment section. In Hawaii, Aloha Friday is the day that they take it easy and look forward to the weekend. So I thought that on Fridays I would take it easy on posting, too. Therefore, I’ll ask a simple question for you to answer in my comment section. Don't forget to leave comment. Nothing that requires a lengthy response. Aloha! I hate to dust. Stirring up the dust bunnies makes me sneeze and puts me in the worst humor. I put it off as long as I can before I do it. I have tried using dusting products and the disposable Swifters but I still detest dusting. Don't forget to leave your answer in my comments. I will buzz you back. For more Aloha Friday click here. In Hawaii, Aloha Friday is the day that they take it easy and look forward to the weekend. So I thought that on Fridays I would take it easy on posting, too. Therefore, I’ll ask a simple question for you to answer in my comment section. Nothing that requires a lengthy response. Mine is FORGIVEN. I am defined by my personal relationship with Jesus Christ. I am FORGIVEN. Everything else about me related back to this life defining truth. FORGIVEN. For more Aloha Friday click here and enjoy. Do you wear rain boots? I saw some of the cutest rain boots at Charming Charlies (Memphis area) for $about 30.00 and did not buy any. I think I am going to have to go and get me a really colorful pair of rain boots. We are having unseasonably wet rainy weather here. And I think some bright rain boots might be just what I need to cheer my rainy days! So do you wear rain boots? Please leave me a comment and I will respond as quickly as I can!! Blessings. For more Aloha Friday click here and enjoy! I have become a list maker because I can't keep up with my stuff otherwise. I keep a calendar with all my appointments and deadlines penciled in. However, this week I almost went to my hair salon appointment a week early! So much for all attempted to get organized! If you would like to see some other Aloha Friday entries just click here. Welcome to my blog post for this week's Aloha Friday.In Hawaii, Aloha Friday is the day that they take it easy and look forward to the weekend. The idea is that I’ll ask a simple question for you to answer. Nothing that requires a lengthy response.Are you a morning person or a night owl? I am not a morning person. I dread going to bed at night because I hate to think about getting up in the morning! Seriously, not a morning person. But now if you want to sit up all night, drink coffee, and sit at the kitchen table until the wee hours . . . well, I'm your girl! Blessings. So are you a morning person or a night owl? Leave a note in my comment and click over to Island Life to read some more. Welcome to this week’s edition of Aloha Friday. In Hawaii, Aloha Friday is the day that the Islanders take it easy and look forward to the weekend. In that tradition, Island Life is hosting a meme called Aloha Friday. If you’d like to participate, leave your answer to my question in the comment section. Then just post your own question on your blog and leave your link to your Aloha Friday blog post by clicking here and going to The Island Life. Don’t forget to visit the other participants! It’s a great way to make new bloggy friends! My question is: Are you a football fan? If so, what team do you follow? Personally I am not particularly a fan of the game with one exception. I do love to watch Mississippi State football. Both boys went there to school and I still feel a strong affinity to that school, although all I ever did was send my children and my money there. My youngest son, Dawson, was quite a standout football player in high school and I had a love/hate relationship with the game. It scared me to watch him play but I couldn't take my eyes off him! Now, leave your answer in my comment section and I will return the favor. Blessings. If you’d like to participate, leave your answer to my question in the comment section. Then just post your own question on your blog and leave your link to your Aloha Friday blog post by clicking here and going to The Island Life. Don’t forget to visit the other participants! It’s a great way to make new bloggy friends! My question is: To read more Aloha Friday click here and play along. Here is my Aloha Friday question. What is your favorite fish or seafood? Mine is shrimp. I love nearly all fish and every variety of seafood, but shrimp has been my lifelong favorite. We live in Memphis and getting "fresh" seafood is not easy. For a couple of days I have been in Louisiana and I have eaten the BEST shrimp. I will be blogging about my culinary tour of LaFayette, LA. complete with pictures. So you don't want to miss that. But the shrimp. Oh, the shrimp. Outstanding! Leave your response in my comment section. Then write you own question, link your blog post URL to Island Life and join in all the fun. Stop back by and play 5 Things Friday with me. This week the blog post is about my 5 Favorite Things. Blessings. Welcome to this week’s edition of Aloha Friday. In Hawaii, Aloha Friday is the day that the Islanders take it easy and look forward to the weekend. In that tradition, Island Life is hosting a meme called Aloha Friday. If you’d like to participate, leave your answer to my question in the comment section. Then just post your own question on your blog and leave your link to your Aloha Friday blog post by clicking here and going to The Island Life. Don’t forget to visit the other participants! It’s a great way to make new bloggy friends! I am not a morning person so anytime before noon is not good for me! I love the early evening. Around 6:00 p.m. my day is winding down. My husband is getting home. We sit in the den and talk about our day. It is my favorite time of the day. Remember, leave me your answer in my comment section and then get back to your blog and post your own question. Then hop over to Island Life or just click here to link your blog post up to her site. Join in to meet lots of great bloggers and share in the fun. Blessings. Welcome to this week’s edition of Aloha Friday. In Hawaii, Aloha Friday is the day that they take it easy and look forward to the weekend. In the spirit of Aloha Friday, I am participating in the meme at An Island Life. Here is how it works. I ask a question. You answer it in my comment section. Then you post your own question and link your blog post at An Island Life. And don't forget to read other bloggers posts and see what's on their minds on Aloha Friday. Here is my question. My favorite sandwich is low-fat Swiss cheese and ham grilled on raisin bread and then dipped in Honey Mustard dressing. Yummo! If you’d like to participate, just post your own question on your blog and leave your link here. Don’t forget to visit the other participants! I love Mexican food. My favorite Mexican meal starts with salsa and chips. Oh my. I love me some chips. Crispy. Salty. Thin chips. And salsa. Oh yeah . . . lots of salsa. Then bring on the fajitas. I love chicken fajitas with a side of guacamole and a bit of sour cream. This is my favorite meal. Now, please tell me what is your favorite meal in my comment section. Thanks a million. If you would like to participate in Aloha Friday, click here and go there! Our friend over at Island Life hosts this fun carnival every Friday. In Hawaii, Aloha Friday is the day they take it easy in preparation of the weekend. We in the blogosphere have adopted the same philosophy. Here is a quick question that does not require a lengthy response, but please join in the fun. When you have finished jump over to Island Life and read some more. I am known to get hung on a word or phrase and use it repeatedly. Currently my word is, "Seriously." It is a great word. It can work as a question, a declaration, or an appropriate comment when you do not know what else to say. If I were to design a tee shirt to show my current favorite word or phrase, it would say, "Seriously? Seriously!" Here is my question. If you were to design a tee shirt to wear that told something about you, what would it say? By the way, my giveaway for Spring Fling is still going on until Saturday at 2am. Click here and register to win my Bible Study on the Book of James and the accompanying 10-set CDs. 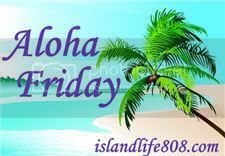 Over at Kilani's blog she started the Aloha Friday, in honor of in Hawaii, Aloha Friday is the day that they take it easy and look forward to the weekend. So she thought that on Fridays she would take it easy on posting, too. I thought this is a great idea so therefore, I’ll ask a simple question for you to answer. Nothing that requires a lengthy response. Today is a dreary and rainy day in Memphis. It is the kind of day that makes me want to curl up with a good book, a cup of coffee, an afghan and a cat and spent the day on the couch. How do you like to spend a rainy day? Post your comment and then click over to Kilani's blog and read other great posts.